“Bloodbath” is the new video from Greek thrashers SUICIDAL ANGELS. The song is the title track of the band’s new album, which was released on January 27 via NoiseArt Records. The CD features cover artwork by Ed Repka, who has previously worked withMEGADETH and DEATH, and who was responsible for the cover to last year’s “Dead Again”. “Caged In” is the new video from Louisiana rockers LILLIAN AXE. The song comes off the band’s new album, “XI: The Days Before Tomorrow”, which was released in Europe on January 27 through Germany’s AFM Records and in North America on February 14 via CME Records. “Darkness Within” is the new video from Sydney, Australia-based metallers DRAGONSCLAW. The track comes off the group’s debut album, “Prophecy”, which was released in January via Arkeyn Steel Records. “Over The Edge” is the new video from the Milan, Italy-based female-fronted rock/metal act EXILIA. The clip was filmed in Berlin, Germany with director Oliver Sommer from Ava Studios. The video’s concept is inspired by a weird surreal short tale from Roald Dahl. 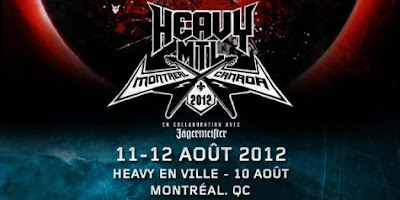 Then onto some news of two big Canadian Metal Festivals the first being in Toronto. 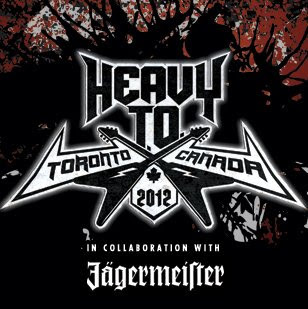 FIVE FINGER DEATH PUNCH, KILLSWITCH ENGAGE, CANNIBAL CORPSE, KATAKLYSM and SUICIDAL TENDENCIES are among the newly confirmed bands for the Heavy T.O. festival, set to take place August 11-12 at Downsview Park in Toronto, Ontario, Canada. Tickets are on sale now at HeavyTO.com. Then Montreal gets the same festival the same weekend but the groups are flipped to different days of course. Heavy MTL will return to Montreal, Qebec, Canada at Parc Jean-Drapeau on August 11 and August 12. As of now, weekend passes for Saturday, August 11 and Sunday, August 12 at Parc Jean-Drapeau are going on sale via HeavyMTL.com, by phone at (514) 790-2525 or 1-877-668-8269 in person at the Bell Centre box office. As a special offer, clients who buy Reserved Seating Weekend Passes and the first 500 clients who buy General Admission Weekend Passes are entitled to receive a download of the new album from Serj Tankian of SYSTEM OF A DOWN that is scheduled for release this August and one download of SCARS OF BROADWAY's new album coming this fall. Two full album downloads per individual ticket purchase. More details and redemption instructions to follow. A few more bands will be added to this lineup and other events that will take part of the festival will be announced soon.